Please don't send any more "I sell single of X at the price of a full stack of X". It's just old now, use it, do it, but no point posting it. funny thing, I am yet to see anyone thinking of not paying fee on russian servers. Some don't take it tho. You should check the armory of the guy complaining about chopper !!! Oh god the official forum one is horrid. 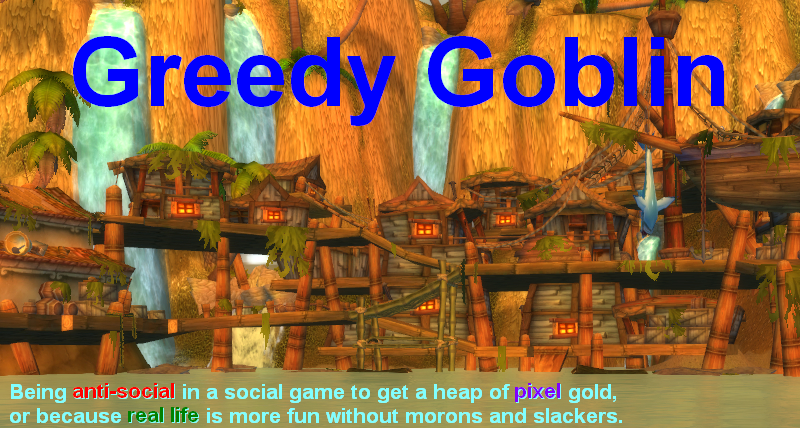 Check out post 57 and see how a paladin wants to make himself look like a smartass >.< I herd u furm foar freeee?!?!? There are quite a few retards there. I think I'm going to go make a post yelling at people for overcutting, just to change things up. Every week there is at least one of the Morons of the Week that really do not fit the criteria and seem are just posted simply because a person does not subscribe to Gevlon's 'philosophy of life'. This week it is the post with the Runecloth. 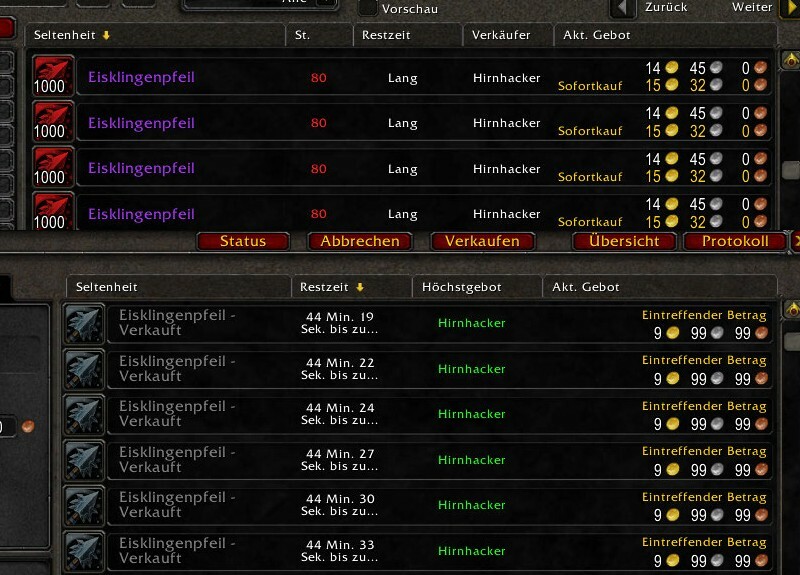 The guy buying up runecloth is being really stupid for not checking the AH since he obviously knows that the AH exists. Someone gave him a bad idea earlier about the price of Runecloth and he failed to do research. That's borderline 'moron' and I have no serious issue with it being posted. The guy who told him that he was overpaying for the Runecloth was definetly not a 'moron'. Heck, there is a very good chance that he did not have any Runecloth to sell so he was going to make 0% profit on the guy either way. Beside that point while I have little issue with taking advantage of people who are willfully ignorant, I have a big problem with propagating ignorance just so you might make a profit. Helping out another human being is not 'wrong or moronic'. It only becomes so if you do it for 'wrong or moronic' reasons. Informing someone that they are being ignorant about an issue definetly does not fall into the 'wrong or moronic' category. "Heck, there is a very good chance that he did not have any Runecloth to sell so he was going to make 0% profit on the guy either way." but, there was Runecloth on the AH for 2g so he could have bought it and resold it to the slacker for the 11g..heck, if he wanted to be a "nice guy", he could have sold it for 10g discount. If there is Runecloth on the AH for 2, and the dude wants to buy it for 10, there is a business opportunity. Even if you don't have Runecloth on you at that moment. Of course, this is also a trick that was played by people some time ago, putting up some niche item for a decent price (blue boe lvl 75 or so) for say 50g, then asking in /2 with another alt saying you'd pay 90g for it, have it bought, and then not pay up. The chance that this would happen with a commodity good like Runecloth is very low though. There's a business opportunity for the "know-it-all" here even if he doesn't have Runecloth in his possession at the moment. With his knowledge, he could/should be making 8g * the amount of stacks the other dude would be willing to buy @ 10g. Nielas: He couldve bought the runecloth from AH to resell it to him. 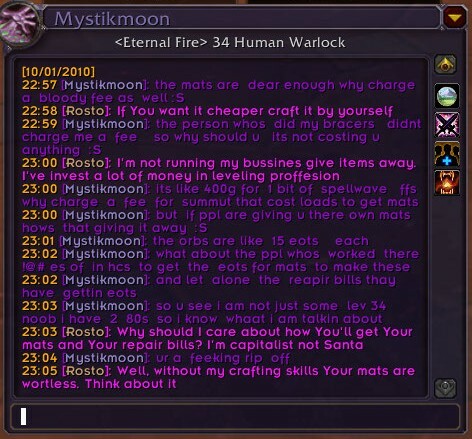 Well, you could have bought 10 stacks of Runecloth off the AH, sold them to him and afterwards tell him that he could have gotten them cheaper. You yourself are less likely to personally profit from this moron in the future, but you can profit from him momentarily. Expensive lessons are always better remembered than cheap ones så in the end he will profit from it too. Poor Nielas was ganked by the Anonymous army. The chopper guy really, really blows my mind. I don't even play that much, but I'm aware that a chopper's an easy 14k... And as your blog shows, it's not hard to make money in this game, he could have easy gotten the gold to buy the chopper from non heavy farming. He just wanted to whine and have people go "oh, you poor thing, blizzard is so mean." So many people telling that guy on the forums to buy and relist. Why is it I never find these people on my realm? 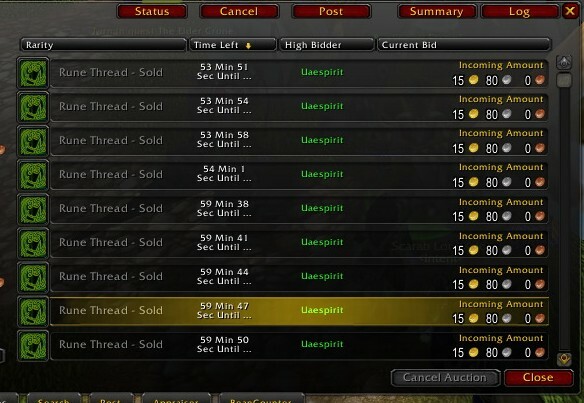 I guess for me the idea of going through all that trouble of going to the AH buying up runecloth only to resell to the guy at 10g seemed a waste of time. All that bother for 88g? Not worth potentially blowing a HS cooldown on. This is of course a conceit on my part since to others 88g might seem like a lot but I assume that for a normal casual player 88g is not a big deal at this point in time. I just have a problem with Gevlon suggesting someone is a 'moron' simply because he does not milk every opportunity for chump change. Heck, I thought Gevlon's AH strategy was based on the fact that it is saner to not try to squeeze every last copper at the expense of your time. I do wish this was more of a discussion board rather than just 'comment once and forget'. I'm with Nielas -- unless you've got the right amount of runecloth in your pocket at the moment, this transaction isn't worth the time. If I'm a regular poster of Runecloth, I don't want to constantly monitor trade chats looking for morons to take advantage of. I want those morons in the AH, and take advantage of them there -- even if the profit is less on a per-deal basis.